Support for over 300 families a year recognised in Community Award. Sharing Parenting, an Evidence Based, Community Interest Company, based in Newmarket since 2009 was recognised for their on going support to professionals and over 300 families in the local area, at an awards afternoon held at the prestigious Newmarket Racecourse on Friday 5th April. There were a number of awards being presented in the region. 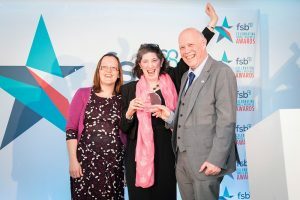 For the Community Award The Federation of Small Business (FSB) welcomed applications from small businesses that partook in initiatives that supported their local community in the East of England. “In our category there were 5 very good organisations shorlisted, we really didn’t expect to win but were over joyed when we did! We are a small but great team and cover a wide area in Suffolk, including Newmarket, Haverhill, Mildenhall, Brandon and Lakenheath. We work with professionals and over 300 families each year delivering parenting programmes and one to one support with amazing outcomes and we are so glad that our support has been recognised by the FSB. We believe that good quality, reliable parenting information and support should be available to all parents and professionals and we have been working hard to ‘normalise’ parenting support. If you would like to find out more about the support Sharing Parenting offers and/or about their free Parenting Conference and guest speakers please see their website www.sharingparenting.com or email info@sharingparenting.com or telephone 01638 665997.